Friday’s Cuba-Taiwan WBC warm-up match looked more like a batting practice session than a serious competitive ballgame as the two clubs combined for 31 runs and 38 hits in Cuba’s lopsided 20-11 victory. It was but another strange twist to a week of pre-tournament training games in Chinese Taipei that has already featured its share of off-the-field headlines. One mid-week game was strangely sullied by an apparent intrusion of disguised Taiwanese scouting “spies” at a closed match (no public or press admitted) between Korea and the Korean League Dinos club; the scheduled Dinos-Cuba game a day later was cancelled well after its scheduled starting time when the Korean pros protested the quality of the baseballs provided by Taiwanese League officials; and the strong Dutch squad found former national team manager and current head bench coach Brian Farley abandoning the squad only hours after their arrival in Taiwan from their earlier training camp in Arizona. The flurry of bizarre sideline developments has created almost as much buzz as the actual on-field games themselves – games which have been highlighted by an encouraging display of offensive power from the Cuban camp. If there has been a major concern surrounding the Cuban squad selected for this spring’s third renewal of the MLB showcase Classic by Victor Mesa and his assistants, it had to be the health of the red-clad offensive machine. The Cuban offense for all its potential potency has often struggled in recent international outings, due largely to the acknowledged overall weakness of recent Cuban League pitching and thus the resulting difficulties of sluggers like Cepeda, Gourriel, Despaigne and Abreu to quickly adjust to the more talented arms of international professionals. Nowhere was the chink in Cuba’s offensive armor more obvious than in last November’s two-game set with the Japanese WBC hopefuls that produced only a single run (a Gourriel solo homer) in eighteen full innings. So far this week the fears of inadequate hitting are quickly being put to rest. Two opening matches with Taipei (6-5 loss) and Australia (5-3 victory) produced 25 safeties and a pair of Despaigne homers, although a continuing negative seemed to be the number of runners left stranded in scoring position during those first matches. The temperature may be cold this week in Taiwan, but at least the Cuban bats are hot! Friday’s lopsided affair displayed Cuban bats coming alive in a manner rarely seen in recent international tournament seasons. The welcomed offensive explosion against tame Taiwanese pitching was launched with a 10-run second inning and featured in the end three more homers for Despaigne (who collected 8 RBI), additional long-ball shots by Abreu and Yasmani Tomás, and 5-for-6 batting displays by both Abreu and Gourriel. All that powerful hitting was dulled only by the relative inability of Cuba’s own first four hurlers to keep the opposition off the scoreboard. Starter Yadier Pedroso – given a 10-run cushion to work with – yielded five hits and 4 earned tallies in his 4-plus innings of work; replacements Odrisamer Despaigne (2/3 of an inning) and Yander Guevara (1/3 frame) were less effective still – yielding seven runs between them in their single inning of labor. 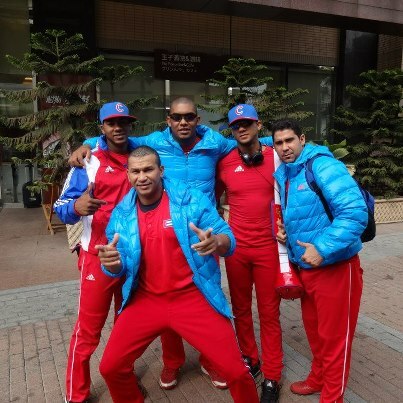 More impressive where the quartet of finishers for Cuba – Norberto González, Raciel Iglesias, Wilber Pérez and Alexander Rodríguez – who blanked the host Taiwanese over the final four innings. The bizarre circumstances surrounding the cancellation of Cuba’s Thursday contest against a Korean pro league team were muted by a Cuban Federation website report that mentioned only “operational reasons” as an explanation for why the game was not played. The actual events were first reported in a brief article of the Dutch baseball Federation website that gave the following account. Taiwanese officials responsible for field operation apparently provided game balls that the Koreans objected to as being “soft and oversized” and thus unacceptable for use. One Korean official was quoted as claiming the balls provided an injury risk for his professional ballplayers. Anxious to get in their scheduled practice match, the Cuban delegation apparently volunteered their own practice balls for use in the contest but the Koreans still balked at the absence of quality baseballs and eventually left the field in protest. The “mystery ball” events may in fact have been related to a more intriguing occurrence two days earlier (also reported by the Dutch website) when Taiwan pro league scouts attempted to view the closed-session 1-0 loss by the Korean WBC squad at the hands of the same Dinos Korean pro outfit. The rare act of “baseball espionage” was uncovered during the contest when the Korean bench noticed an unusually large contingent crammed into the umpires’ box behind home plate and quickly launched a protest; the game was allowed to continue only after the disguised scouts were asked to leave the ballpark. It appears from these reports that the Taiwanese club officials have been carrying on both a covert and also overt program of harassing the visiting Koreans in order to gain every slight advantage possible against the bitter rivals they will face on home turf once official Round One Classic play begins next weekend. Cuba’s biggest test before heading to Japan on Monday will obviously be an upcoming Sunday afternoon match against the Dutch squad – a team that contains numerous holdovers from the talented squad that edged the Red Machine 2-1 in the September 2011 rain-soaked Panama World Cup finale. The Netherlands appears to be one of the strongest clubs competing in Asia and is coming off a series of early training camp wins (mostly against university teams) during their stay in Arizona. But the Dutch surprisingly hit the wall in their own open in Taiwan on Friday, suffering a humiliating 10-5 pounding by a Taichung University squad that is currently Taiwan’s university league champion. The Dutch camp has also had to deal with some off-the-field distraction caused when former national team manager Brian Farley (the skipper for the gold medal club in Panama) suddenly left the squad upon arrival in Taipei. Farley was earlier replaced by former big leaguer Hensley Meulens as national team manager for the Classic but had been counted on to fill the role of head bench coach and Meulens’ top dugout assistant. The surprise departure (reported by the Dutch team website as having been prompted by personal matters) has forced former national team skipper and current Netherlands Federation Commissioner Robert Eenhorn to now fill Farley’s slot on the Orange bench.